The 2018 1oz Gold Swan is the second release in the Perth Mint's Australian Swan series. Thanks to the unprecedented success of both the 2017 Gold Swan and the 2017 Silver Swan, buyers are already lining up to purchase this exquisite limited-edition bullion coin. Why choose the 2018 1oz Gold Swan? Gold has been performing well recently, so it's the ideal time to convert cash into the world's favourite precious metal. Traditionally knows as a 'safe bet', gold can be guaranteed to retain or increase its value despite the effects of a precarious economy. 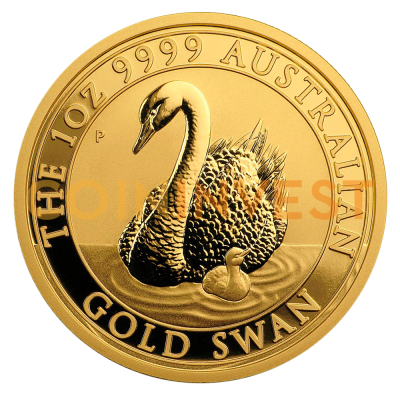 Australian gold is considered among the finest in the world and each 2018 Gold Swan contains a full troy ounce with a purity of 99.99%. After months of speculation, it appears that the Australian Swan Series will feature an annually changing obverse design. Each shimmering gold coin celebrates the famous waterfowl that live close to the Perth Mint's base on the Swan River. For 2018, the Mint's talented engravers have created a heart-warming image of a mother swan gliding across the river with her cygnet by her side. Look closely and you will notice a detail that has been carried over from the first edition; the water ripples extend under the coin's border and can be seen on the rim. It's unique flourishes like this that make the 1oz Gold Swan coin an essential buy for numismatists around the globe. Extremely low mintages combined with exceptional purity and design features have helped to make the 2018 1oz Gold Australian Swan one of the year's most anticipated releases. Don't miss out! Order online now with coininvest.com.